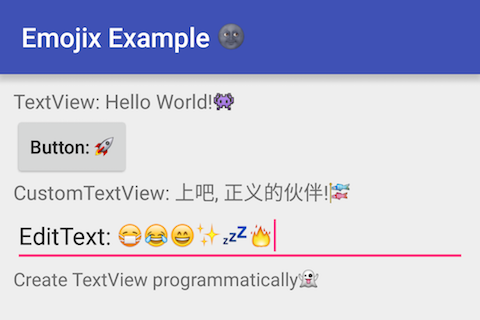 This library help using apple style emojis on your android application the easiest way. Unlike emojicon, this library is non-invasive. Just need to add only a little code to your project. Another thing you need to know is that this library will increase your apk size about 5 MB, because it contains all emoji icon files. Now, everything is OK! Anyway, for implementing emoji to the whole application you can add these code to your BaseActivity. Thanks to the emojicon and Calligraphy projects. This project is based on their contributions.